Rancho Mirage, Indian Wells, Thousand Palms, Moreno Valley, Claremont, Montclair, Riverside, Ontario, Upland, Cucamonga, Redlands, Corona, Las Vegas, and other locations. We also provide service in the states of New York, Illinois, Pennsylvania, New Jersey, Conneticut, Rhode Island, Washington D.C. Maryland, Massachusetts. 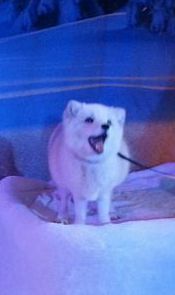 A winter wondeland photo op area in the lobby of a ballroom before the event (above) and the same set at night with lighting, entertainers and a friendly Snow fox to pose with for pictures. 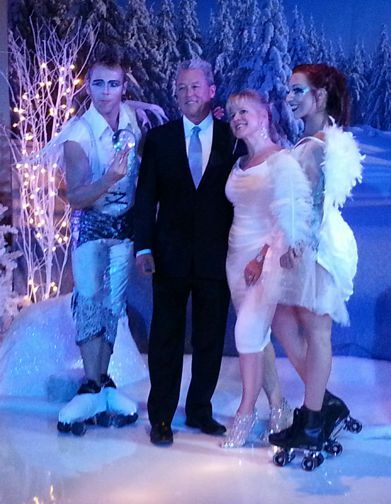 We provide everything for a spectacular winter themed event including: Artificial Snow, live and artificial trees, Penquins, a Snow fox, roller skating snow faeries, bands and frozen theme event entertainers, cirque shows, entertainment lighting, decorative lighting, set decoration, props rental, custom shows and production design, and sound systems. 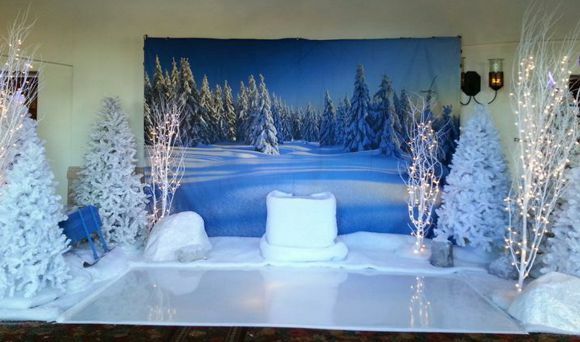 Call us for more information on Winter themed event production and decoration services, we provide full production services to the trade, call for references 714-745-7321.